In between gulping tea (with shots of Jameson honey) and Mucinex and huddling under a heated blanket, it took everything in me to actually bake the pies for my family’s Thanksgiving. As usual, I overdid it: seven adults, four pies. But it’s really the only time of year I make pie, and I get swept up in the excitement and challenge of it. Plus, I’m not allowed into the house without my great-grandmother’s renowned pumpkin pie. (The recipe makes two.) I also attempted my first latticed pie — cherry, which was edible but needs major work. This pie, though, number four — this pie is it. Dutch apple goodness, with soft, syrupy apples and a crunchy, buttery topping. Keep this one in your back pocket for the holidays — or, you know, Tuesday. So, the pie crust. I dug out my handy all-butter pie crust recipe, and replaced some of the butter with the coconut oil. I was attempting to compensate for vegetable shortening, which all the experts say is key to a flaky crust. I’ll spare you the deep analysis and just tell you that it worked — but I don’t know that the coconut oil added anything. You can’t taste it, and I also couldn’t see any influence on flakiness. I’ll say this, if you’re interested in coconut oil (and its health benefits), you can add it. If you’re in the all-butter camp, that works too. I can’t say I was swayed one way or the other — they’re both delicious options. My major pie crust breakthrough actually came by accident. I find a new way of making crust nearly every time I do it: by hand, in the food processor, with vodka, now with coconut oil. Practice makes perfect, right? I’m usually loyal to hand mixing with a pastry blender, preferring to use that tool to cut the butter into smaller pieces while blending with flour. By the time I got to Thanksgiving I was lazy (and ill) and just grated my frozen butter instead. I still got a decent arm workout, and the butter ends up the proper size so you don’t have to do as much blending. It’s a trick I’m permanently filing in my arsenal. 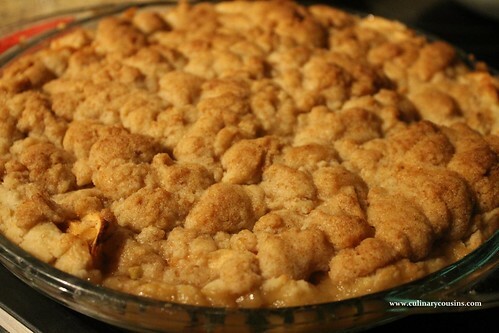 I chose Dutch apple topping since I didn’t want to do a double pie crust. And I think I will always make that choice — the crumble gets crisp and caramelized, the perfect flavor and texture complement to the spiced apples inside. Hurrah, fall! Mix the flour, salt and sugar in a bowl. Add the butter and coconut oil. With a pastry cutter or two knives (or your fingers, really), work the flour, butter and oil together until there are only pea-sized chunks of butter. If you grated your butter, you really only need to make sure everything’s uniformly combined. Add half the water and mix with your hands. Keep adding water a bit at a time until the flour just starts to stick together. It shouldn’t be dry and too crumbly, but it shouldn’t be wet either. It should clump together in your hand when you squeeze it. 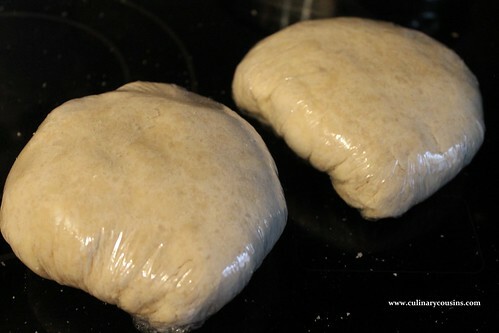 Divide the dough in half and pour out one half onto a piece of plastic wrap. Fold in the corners of the plastic wrap and twist so the crust comes together in a ball. Flatten the ball slightly, and repeat with the remaining dough. Store the two dough balls in the refrigerator for at least 30 minutes before rolling out on a floured surface. Keep the dough as cold as possible so the butter pieces don’t completely melt. Those butter blobs in the dough burst in the heat of the oven and make the crust flaky. When you’ve rolled the dough into a large circle about 1/8-inch thick throughout, move it to your pie dish. You can fold it on itself in half or in fourths to more easily transfer it. You could also roll it around your rolling pin and unroll it on top of your dish. Press the dough to mold to the bottom and sides of the dish, then fold over and crimp the crust around the edge, trimming any extra pie dough, if necessary. Store in the refrigerator until you need to use it, or freeze it if you need to keep it longer. 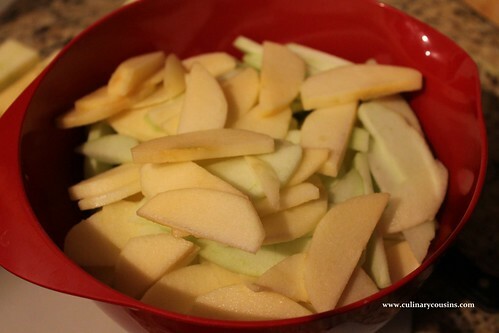 5 1/2 cups apples, cored and thinly sliced — I used a variety of apples, like Granny Smith, Gala, Pink Lady, McIntosh, etc. In a large bowl, mix the apples, lemon juice, sugars, flour, cinnamon and nutmeg until all the apples are coated. Let sit for five minutes. 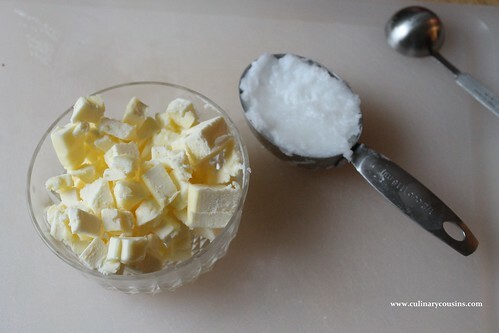 Mix the sugars and flour into the butter with a fork until you have a crumbly texture. Back to the apples. With your hands or a slotted spoon, transfer the apples to your prepared pie shell, leaving behind most of any liquid that’s accumulated at the bottom of the bowl. 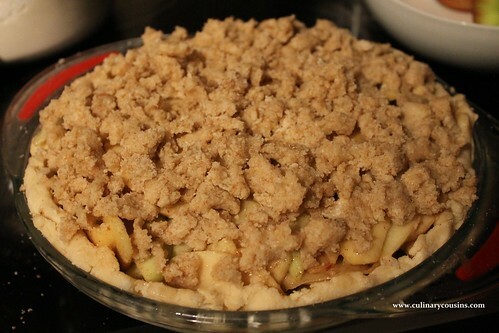 Sprinkle with the topping, evenly covering the apples. Bake uncovered in the oven for 50 minutes.